SEATTLE, Washington, January 30, 2014 (ENS) – The April 2010 fatal explosion and fire at the Tesoro refinery in Anacortes, Washington was caused by damage to the heat exchanger; the severely cracked and weakened carbon steel tubing then ruptured, killing seven workers, finds a draft report released Wednesday by the U.S. Chemical Safety Board. The CSB investigation concludes that the accident at Tesoro could have been prevented had the company replaced the vulnerable carbon steel heat exchangers with inherently safer alloys that were already well known within the industry, but not required. The CSB draft report makes far-reaching recommendations to the U.S. Environmental Protection Agency and the Washington Governor and Washington State Legislature to more rigorously protect workers and communities from potentially catastrophic chemical releases. The report stresses that the accident occurred during a startup of the naphtha hydrotreater unit, considered hazardous non-routine work, particularly due to the reoccurring leaks of flammable liquid. Despite this, required Process Hazard Analyses at the refinery repeatedly failed to ensure that these hazards were controlled and that the number of workers exposed to these hazards was minimized. Past Process Hazard Analyses, including those done by the preceding owner, Shell Anacortes Refining Company, cited only judgment-based safeguards and did not verify whether safeguards listed in the PHAs were actually effective. 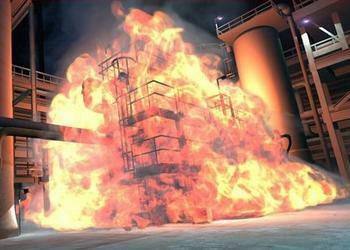 The Chemical Safety Board today released a new computer animation recreating the Tesoro explosion and fire. The five-minute animation illustrates the process of “high temperature hydrogen attack,” which over the years damaged and weakened the 40-year-old carbon steel heat exchanger, leading to a catastrophic rupture on the night of the accident. The animation explains that the seven workers present on the night of the accident were assisting with start up of the heat exchangers. They were mitigating recurring leaks never adequately addressed by Tesoro and manually opening a series of long-winded valves that required over 100 turns by hand to fully open. Using sophisticated computer models, the investigation found the industry-wide method used to predict the risk of HTHA damage to be inaccurate, with equipment failures occurring under conditions the deemed to be safe from HTHA. It cited deficiencies in the company’s safety culture that led to a “complacent” attitude toward flammable leaks and occasional fires. The draft report states that recommended practices of the American Petroleum Institute, an industry association, are written “permissively” with no minimum requirements to prevent HTHA failures. Tesoro, based in San Antonio, Texas, is one of the largest independent refiners and marketers of petroleum products in the United States, owns and operates the Anacortes refinery. It supplies gasoline, jet fuel and diesel fuel to markets in Washington and Oregon, and manufactures heavy fuel oils, liquefied petroleum gas and asphalt.